For my birthday my husband wanted to take me out and I wanted to try somewhere new. I decided on 900 Wall as it wasn't a brewery and I had heard good things about their happy hour from some of our neighbors. I checked out the menu on their website before hand and I was pleasantly surprised by their drink prices. $4.00 for house reds and whites, $5.00 lemon drops/cosmo's, and between $2-4.00 for assorted beer. Those are awesome prices considering I paid $8.00 for a glass of wine at M-Bar! Ouch! We wanted to beat the dinner rush and have some quiet romantic time so we arrived at 4:00pm on a Sunday and had our pick of the tables. The restaurant really is very pretty inside. It's urban with stainless steel and exposed brick but they had some beautiful candle sconces on the brick wall that softened it up and made it quite cozy. We spread out on raised bar table for 4 on the south side of the restaurant, near the entrance wedged in between two windows looking out on Wall Street and Minnesota. Shawn ordered the Monkey Face Porter for $3.00 and I had the house white for $4.50, not the $4.00 they stated on the online menu. The wine was good. I'm a little rusty in the wine department but I'd say it was a Sauv-Blanc. Shawn has had Monkey Face Porter before and said it was good as usual. We then went on to order way too much food! Their serving sizes are huge and their burgers and sandwiches actually come with sides, which adds value to their happy hour in my opinion. 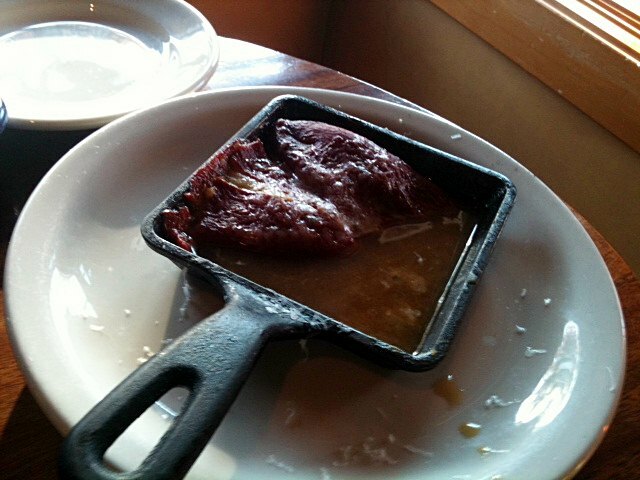 We ordered the stuffed piquillo peppers, the pepperoni pizza and the prime rib sandwich with fries. The stuffed peppers were served in a tiny cast iron skillet so the presentation was cute. They tasted good but were a little too soft from being cooked and served in a watery broth. An order came with three stuffed peppers and cost $3.00. 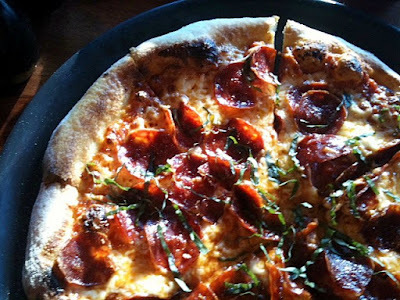 The pepperoni pizza was large and had good quality pepperoni on it as well as fresh basil. It had a delicious thin crust and altogether was a quality product for the great price of $6.00. I would get it again and again considering the bad pizza you get at a particular unnamed pizza chain for $5.00. The star of the night however was the prime rib sandwich. 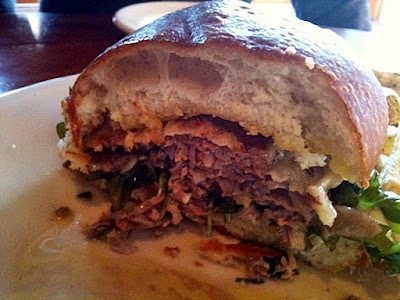 I have a very soft spot in my heart for prime rib sandwiches as they were my favourite thing to order as a little girl dining at Elizabeth's Chalet in Cloverdale B.C. with my grandparents, George and Audree Amundson. 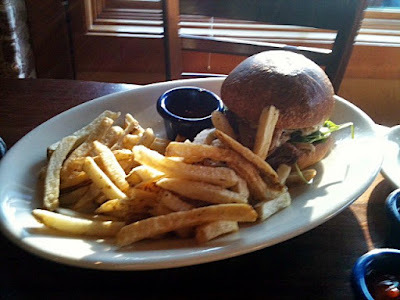 I adored the soft, thinly sliced prime rib heavily layered on a fresh bun and topped with caramelized onions and Swiss cheese. This prime rib sandwich was a little more grown up. It was comprised of layers upon layers of thin, high quality prime rib on a fresh baked brioche bun topped with Gruyere and horseradish creme fraiche. It was the most amazingly delicious thing I've eaten in months! That sandwich was the type of sandwich I dream about. I HIGHLY recommend it!